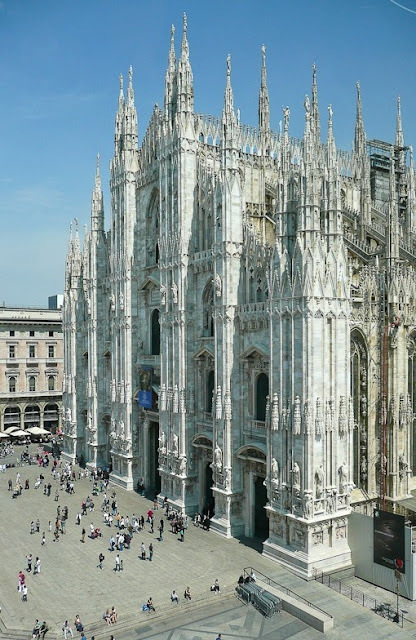 Milan Cathedral (Italian: Duomo di Milano; Lombard: Domm de Milan) is the cathedral church of Milan, Italy. Dedicated to Santa Maria Nascente (Saint Mary Nascent), it is the seat of the Archbishop of Milan, currently Cardinal Angelo Scola. The Gothic cathedral took nearly six centuries to complete. It is the fifth largest cathedral in the world and the largest in the Italian state territory. Milan's layout, with streets either radiating from the Duomo or circling it, reveals that the Duomo occupies what was the most central site in Roman Mediolanum, that of the public basilica facing the forum. Saint Ambrose's 'New Basilica' was built on this site at the beginning of the 5th century, with an adjoining basilica added in 836. The old baptistery (Battistero Paleocristiano, constructed in 335) still can be visited under the Milan Cathedral, it is one of the oldest Christian buildings in Europe. When a fire damaged cathedral and basilica in 1075, they were later rebuilt as the Duomo.